The Glamourologist is a Wonderful Woman who blogs about the history of cosmetics and make-up. Clearly I had to ask her to write a guest post about lipstick! ''Collecting historical lipsticks was never an urge of mine and I think the great intimacy of the product is the reason why. And anyway, makeup is just makeup right? I talk a lot about how cosmetics are one of the most intimate and personal things to collect and lipsticks are a good example of this - we carry them around in pockets and handbags, secretly look in mirrors to check our lips are still perfectly made up, go in groups to the toilets to apply and re-apply, and compare colours with each other. But what we may not appreciate is the cultural and political significance of this little every day item. One of the earliest identifiable lip sticks was found in the Sumerian region of Ur, roughly 200 miles south of Babylon, during excavations. This is thought to date from 3500 B.C but references to reddening of lips are also to be found in Egypt, most specifically the Papyrus Ebers which reports on Queen Nefertiti reddening her lips with henna lye. Although every recorded culture has had someway of darkening their lips the word we know only dates from approximately AD 1000. By 1889 this had become lip stick and was part of every day English usage but really only in reference to the stage makeup that actors wore. By the late 1920s the word had changed again to become lipstick and this was added to the dictionary ensuring its posterity. By 1910 Beauty Doctors such as George Burchett would offer the more daring society lady the opportunity to visit his studio for 'permanent tinting' - injecting dyes into her lips and cheeks as well as outlining the lips. This was not always a success and some ladies were left with very strange results. The wearing of make up has long been identified with class and has a very interesting history of use as indicator of political allegiance, your place in society as well its well known use as a calling card for prostitutes. In the French Revolution wearing lip stick or any kind of makeup was a sign you sympathised with the aristocracy. In 1912 the use of lip stick was seized upon as a symbol of women's emancipation and Elizabeth Candy Stanton, Charlotte Perkins Gilman and other feminists marched at the front of a 1912 NYC Suffrage Parade with bright red lipstick. Although lip stick has a long history the packaging and presentation we are familiar with only dates to the end of the 1800s when Guerlain introduced lip rouge in a stick form - usually covered in paper. 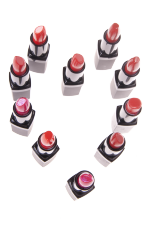 The first modern lipsticks in metal cases were produced by Maurice Levy and the Scovil Manufacturing Company of Connecticut in 1915 and it was not until 1921 when the first screw up lipstick was introduced. Lip gloss and the lip brush were pioneered by makeup innovator Max Factor in the late 20s. One of the first known instances of the term 'Generation Gap' came in 1925 to define the generation that wore lipstick and those that did not. Take 2 ounces of paraffin wax; 3 ounces of white Vaseline; 1 ounce of white beeswax; 3 ounces of ceresine; 1 ounce of titanium dioxide; and 6 drachms of carmine. Melt waxes over a water bath. Grind in finely powdered carmine, then mix in titanium dioxide. Strain the hot liquid through linen and set aside. When temperature comes down to 110 degrees F, pour into moulds to set. Getting the perfect pout has been a subject of innovation and experimentation since the dawn of time and these have included lipstick stencils, lipstick pads, as well as the pouts created for Hollywood stars such as the Clara Bow (lipstick in a heart shape), Mae Murray 'the girl with the bee stung lips', Joan Crawfords 'Hunter's Bow lips' and the 'slash' mouth crated for Bette Davies by Ern Westmore. In Britain there were lipsticks equipped with accessories such as emergency flashlights in case of blackout but the cosmetic industry production was cut to 25% of its pre war out put with the 1940 Limitation of Supplies order and women were encouraged to hoard their lipsticks, cut back on their use and find alternatives. A popular DIY alternative was using Beetroot Juice on your lips to gain a rosy coloured stain.